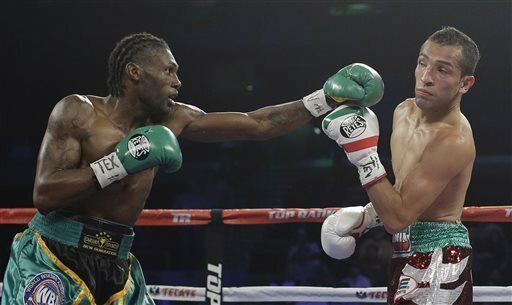 In the opening bout of the main telecast unbeaten Jamaican Nicholas Walters (23-0 19KO’s) made a successful first defense of his WBA featherweight title stopping Alberto Garza (25-6-1 20KO’s) in the fourth round. Walters who won the vacant belt back in December last year looked sharp despite the lay off as he controlled the action right from the opening bell. He had Garza in trouble in the first and was using a simple left jab straight right hand combination to easily take the opening rounds. Garza tried switching southpaw in an attempt to get close enough to Walters to land a significant punch but only succeeded in landing a low blow and very little else. The fourth and final round had somewhat of a controversial ending as Garza was put down with what looked like a crushing body shot but the referee determined it to be a low blow. Garza took his time to get back up but never looked comfortable and was caught cold seconds later as Walters closed the show with a beautiful right hand which sent Garza sprawling to the canvas with the fight being stopped immediately. Walters gains a TKO victory and has enhanced his reputation as a player in the talent rich featherweight division. He looked in superb shape and although Garza was a game opponent the gulf in class was huge. Jamaican’s love their sport and now they have a world class boxer to get behind.